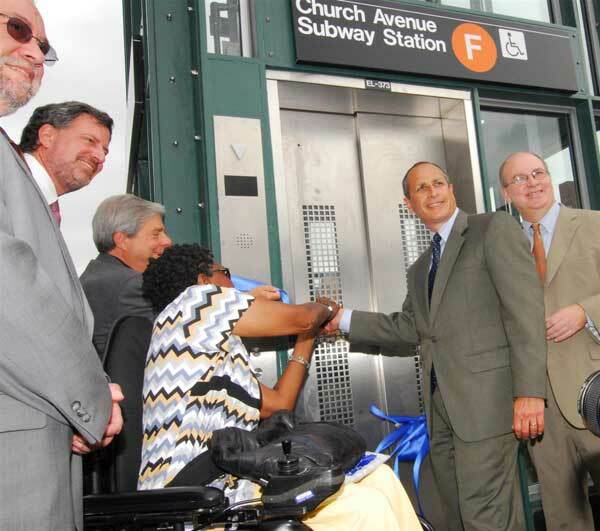 MTA officials at the Church Avenue station showcasing the newly installed elevators. New York City Transit customers with disabilities will now be able to take advantage of three new elevators at the Church Avenue F station. The elevators connect the street with the platform level on both platforms at the station, used by more than 9,000 customers on an average weekday. In addition, closed-circuit televisions and talk-back systems have been installed in the elevators, which will go into service following this ribbon cutting ceremony attended by MTA Executive Director and CEO Elliot G. Sander, MTA NYC Transit President Howard H. Roberts, Jr., Brooklyn Borough President Marty Markowitz, New York State Assemblyman Jim F. Brennan, Congresswoman Yvette D. Clarke, New York City Councilman Bill DeBlasio, New York State Senator Eric L. Adams and community officials. The completion of this project brings the number of accessible stations under the Americans with Disabilities Act (ADA) to 66 as NYC Transit continues to invest heavily in the installation and maintenance of elevators so that the subway system can be accessible to as many people as possible. The station also received repair and modification of platform edge strips, the fare control area, lighting and handrails, all contributing to increased accessibility. The installation of Braille/Tactile signage and TTY public telephones was also included in the more than $15 million project. The project also included the renovation of the station’s two public bathrooms, which are now accessible to persons with disabilities. “The subway system is an asset that should benefit everyone. Unfortunately, because the vast majority of the system was built without elevator access, many New Yorkers find it difficult or impossible to access this fast and efficient means of transportation. However, with every station we make accessible, more and more New Yorkers will be able to enjoy the system travel on their own schedule,” said NYC Transit President Howard H. Roberts, Jr. “Opening these elevators in effect opens up the City,” added Roberts. While making the Church Avenue F station an ADA key station has always been a part of NYC Transit’s plan, Assemblyman Brennan’s allocation of $500,000 of capital funding significantly accelerated the timing of this project. The improvements at this station are particularly meaningful for the 100 legally blind persons who regularly use this station to and from their jobs at the New York City Industries for the Blind’s workshop, located nearby. The new elevators are included in NYC Transit’s lift-net monitoring system so that technicians will be informed immediately in the event of an elevator breakdown, ensuring faster response and repair. In 2007, sixteen ADA elevators were installed in six stations city wide. So far this year, eight ADA elevators have been opened in four stations and nine more are planned for completion in three additional stations. These accessibility improvements were funded through the MTA Capital Plan. Since 2000, including planned investments through 2009, NYC Transit will have spent $130 million on ADA-related investments at 10 key stations in Brooklyn. As a reminder, NYC Transit operates the largest accessible bus fleet in the world, with 4,500 vehicles being equipped with either lifts or a combination of low floors and ramps. Additionally, more than 300,000 trips are provided by NYC Transit’s Access-A-Ride Paratransit service each month. I look forward to the day when all 468 stations are ADA Compliant as that is something that should have been done by now!